For the pop trio, see Factory (band). 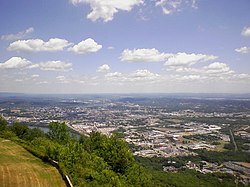 Chattanooga is the fourth-largest city in Tennessee, a state in the United States of America. Cities larger than it are Memphis - the largest; Nashville - the capital of the state; and Knoxville. Chattanooga is in the southeast of Tennessee. The first people to live in the Chattanooga area were Native American Indians with sites dating back to the Upper Paleolithic period. The United States Census Bureau say that the city has a total area of 143.2 square miles (370.8 km²). This is made up of 135.2 square miles (350.2 km²) of land, and 8.0 square miles (20.6 km²) of water (5.56% of the total area). Wikimedia Commons has media related to Chattanooga, Tennessee. This page was last changed on 14 November 2017, at 01:47.